Start decorating the halls and ballrooms with the bright colored Happy New Year signs, door covers, and photo prop backdrops available from Party Express. 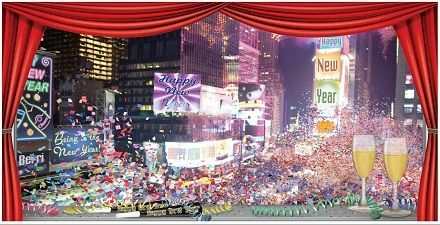 These New Year's Eve wall decorations are available in bulk at deeply discounted wholesale prices. 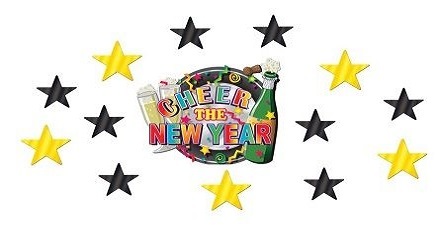 Whether you are looking for Happy New Year signs with fireworks and champagne, or year specific signs you will find an abundance of wall decorations right here at PartyExpress.com. To help accent your wall decorations we also have a large amount of foil stars that look great hung up next to any decoration. In addition to wall decorations you will also find door covers, some of which are hilarious with the baby new year included in the artwork. Start decorating and stop spending too much on decorations by selecting the bulk New Year's Eve signs and wall decorations available from Party Express. Setting up your very own photo booth is a breeze with the backdrops that you will find right here. These plastic backdrops are huge and will fill up an entire wall! You can choose from a city backdrop to Times Square. After you select the proper backdrop do not forget about the fun costume accessories that you will need for your guests to wear as they are getting their picture taken in your New Year's Eve Photo booth.